If you look at the calendar, spring is still a few weeks away, but meteorological spring starts Friday! So what does this mean for the Stateline? Hopefully, a big warm-up. And here's why. On March 1st, the official start of meteorological spring, our sun angle is still fairly low. Combine that with less than 12 hours of sunlight to help warm those temps up, and average highs are barely squeaking into the 40s. Let's fast forward to the end of the month. Not only do we add an hour and a half to our total amount of daylight, but a higher sun angle gives us the ability the warm up more. Heading into April, we're talking average highs well into the 50s! As for the actual forecast, it'll be a chilly weekend with sunshine and highs in the upper 20s, but we do look to warm into the 40s by the middle of next week. We are definitely making up for lost time in the snow department this month. After adding up what fell from Tuesday afternoon to early Wednesday morning we officially recorded 4.6" at the Chicago/Rockford Int'l Airport. This makes Tuesday's snowfall not only the largest snow event we've seen so far this winter season, but it also puts us at the 5th snowiest February in Rockford since records began in 1906! Who would have thought after such a dry and hot summer and mild start to the winter season. The snow will continue to add up today and tonight with additional totals through today will range between 1"-2", with a few isolated highers amounts north and west. 9:00 am Update: A band of moderate to heavy snow has developed south and southwest of Rockford from Sterling, Dixon, Rochelle, Creston, Malta and Genoa. Snowfall totals closer to 2" will be likely today where the moderate snowbands set-up. Light snow will continue this morning as weak low pressure systems move through Wisconsin and Iowa. The snow expected today won't be as heavy as Tuesday, but visibility has been dropping to less than 3 miles where the snow is currently falling to the west. Winds will remain gusty from the north with sustained winds between 15-20 mph and gusts near 25 mph. East/west roads may continue to see a little drifting as well as rural and open areas. Additional snow accumulation today will be between 1"-2". Due to the light snow and potential for freezing drizzle south of Rockford the Winter Storm Impact forecast will remain at yellow. Use caution when out this afternoon. Main roads will remain clear, but wet, with secondary and rural roads still a little snow and slush covered. 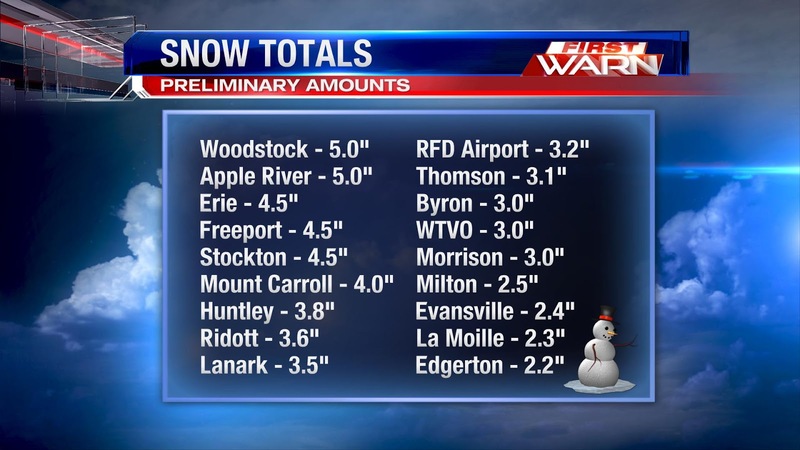 Here are preliminary snow reports from Tuesday. 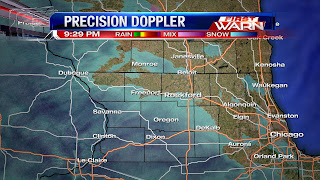 The heaviest snow we saw took place at opposite ends of the viewing area - Whiteside and McHenry counties. 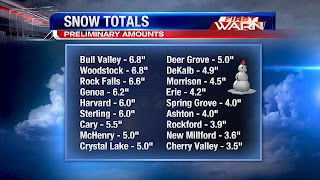 Many cities in those areas saw well over six inches of snow. Take those two counties out of the mix, and snow totals ranged from about 2-5" across the Stateline. 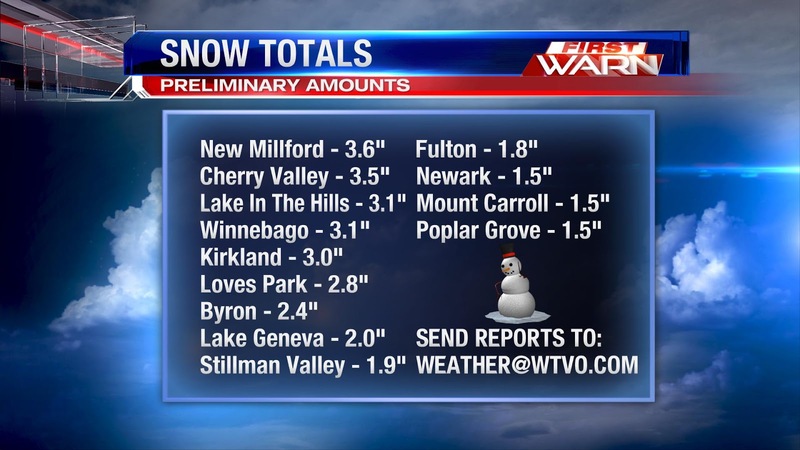 Remember to send your snow totals to weather@wtvo.com! 8:24pm Update: Main roads are still looking messy around Illinois. If you're out, stay safe out there! Red indicates snow covered roads. Yellow means patchy slick spots and green means roads are generally clear. 7:33pm Update: Snow becoming more scattered in nature. Heavier snow showers in Carroll and northern Whiteside counties... as well as a line ranging from Winnebago to northern Boone. (7:14:52 PM) nwsbot: Local Storm Report by NWS LOT: Winnebago [Winnebago Co, IL] broadcast media reports SNOW of M3.1 INCH at 07:00 PM CST -- liquid equivalent 0.30 inches. 6:24pm Update: Radar showing another pocket of heavy snow in northern DeKalb County. Drier air in Rockford for the moment. (6:26:18 PM) nwsbot: Local Storm Report by NWS LOT: Woodstock [Mchenry Co, IL] co-op observer reports SNOW of M5.0 INCH at 06:13 PM CST -- storm total 5.0 inches. snow depth 6 inches. liquid content 0.57 inches. (6:17:47 PM) nwsbot: Local Storm Report by NWS MKX: Newark [Rock Co, WI] trained spotter reports SNOW of M1.5 INCH at 06:09 PM CST -- blowing and drifting snow. snow covered roads. 5:42pm Update: We have seen a few updates to our watches and warning. 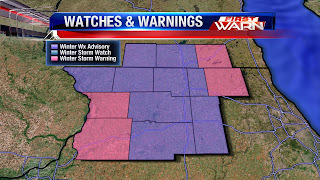 McHenry (IL) and Walworth (WI) are now under a Winter Storm Warning because of expected snow totals. This doesn't really change the big picture... we're still talking snow and heavy winds through the rest of this evening. 5:28pm Update: Radar is continuing to show pockets of dry air moving through the Stateline, although we are still seeing moderate snow showers in areas around Oregon, Dixon, Rochelle, and DeKalb. (5:14:34 PM) nwsbot: Local Storm Report by NWS LOT: 1 ESE Winnebago [Winnebago Co, IL] cocorahs reports SNOW of M1.1 INCH at 05:00 PM CST -- storm total 1.1 inches. (5:10:36 PM) nwsbot: Local Storm Report by NWS LOT: Cary [Mchenry Co, IL] public reports SNOW of E5.5 INCH at 04:45 PM CST -- total so far. (4:42:03 PM) nwsbot: Local Storm Report by NWS LOT: 2 N Winnebago [Winnebago Co, IL] broadcast media reports SNOW of M2.1 INCH at 04:38 PM CST -- storm total 2.1 inches at wrex. (4:32:24 PM) nwsbot: Local Storm Report by NWS LOT: 2 WNW Bull Valley [Mchenry Co, IL] trained spotter reports SNOW of M6.1 INCH at 04:20 PM CST -- storm total 6.1 inches so far. (4:22:30 PM) nwsbot: Local Storm Report by NWS LOT: Crystal Lake [Mchenry Co, IL] trained spotter reports SNOW of M5.0 INCH at 04:06 PM CST -- storm total 5.0 inches. several vehicles in ditches. 4:15pm Update: Our patch of dry air is now moving into northwestern Illinois with more snow moving back in behind it. (4:16:32 PM) nwsbot: Local Storm Report by NWS LOT: Rockford [Winnebago Co, IL] trained spotter reports SNOW of M3.0 INCH at 04:11 PM CST -- storm total 3.0 inches so far. (3:41:12 PM) nwsbot: Local Storm Report by NWS LOT: DE Kalb [De Kalb Co, IL] trained spotter reports SNOW of M3.3 INCH at 03:30 PM CST -- updated report. storm total so far after 4 hours. 1.5 inches in past 1.5 hours. moderate snow with low visibility at time of report. (3:39:14 PM) nwsbot: Local Storm Report by NWS LOT: DE Kalb [De Kalb Co, IL] trained spotter reports HEAVY SNOW of M2.5 INCH at 03:00 PM CST -- storm total so far at northern illinois university. (3:35:07 PM) nwsbot: Local Storm Report by NWS LOT: 3 WNW Bull Valley [Mchenry Co, IL] cocorahs reports HEAVY SNOW of M5.5 INCH at 03:30 PM CST -- updated report storm total so far. 1.5 inches in past hour. still heavy snow but smaller flake size. 3:20pm Udpate: Good news for our friends along the I-88 corridor. We're starting to see a break in the snow! It is most pronounced in Lee County, but don't be fooled. More snow is coming and strong winds are expected to continue through the evening, meaning continued whiteout conditions, blowing and drifting snow, and messy roads. Stay safe out there! (2:59:53 PM) nwsbot: Local Storm Report by NWS LOT: 3 WNW Bull Valley [Mchenry Co, IL] cocorahs reports HEAVY SNOW of M5.5 INCH at 02:30 PM CST -- 2.1 inches in past hour up to time of report. follow up call with bull valley pd indicated numerous motorists stranded on side of roadways and numerous accidents. agencies have gone to their emergency snow plan. plows cannot keep up with snow due to significant blowing and drifting. (2:59:25 PM) nwsbot: Local Storm Report by NWS LOT: Rockford [Winnebago Co, IL] public reports SNOW of M1.9 INCH at 02:51 PM CST -- in central rockford. broadway and 7th street. (2:49:40 PM) nwsbot: Local Storm Report by NWS LOT: N Capron [Boone Co, IL] cocorahs reports HEAVY SNOW of M1.5 INCH at 02:00 PM CST -- snow so far. snow began at 100pm. visibility occasionally less than 1 block during frequent wind gusts. 2:45 Update: Roads are continuing to go downhill fast thanks for bursts of heavy snow and strong winds. Here's a picture Candice took of Highway 20 heading east. 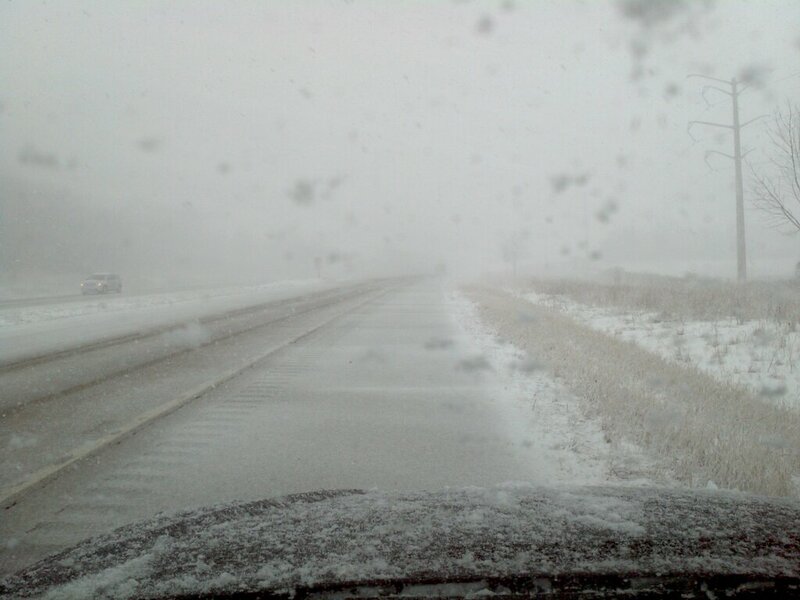 Remember to slow down and use extra caution because near whiteout conditions are being reported across the area. Here are visibilities as of 2:45pm. 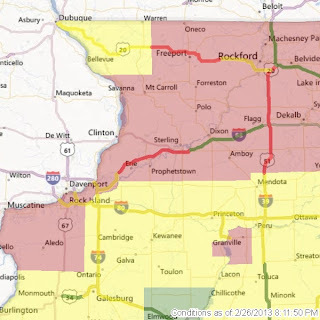 The most affected areas start around Freeport and Rockford and head south and east. Expect these conditions to continue over the next several hours. (2:46:13 PM) nwsbot: Local Storm Report by NWS LOT: NE Rockford [Winnebago Co, IL] public reports SNOW of E1.0 INCH at 02:30 PM CST -- visibility half mile. (2:39:34 PM) nwsbot: Local Storm Report by NWS LOT: Capron [Boone Co, IL] trained spotter reports HEAVY SNOW of M1.5 INCH at 02:02 PM CST -- snowfall in 1 hour. blowing snow and snow covered roads. (2:37:21 PM) nwsbot: Local Storm Report by NWS LOT: DE Kalb [De Kalb Co, IL] trained spotter reports SNOW of M1.8 INCH at 01:55 PM CST -- snow total so far in past 2 hours. a few hundred feet of visibility in wind driven snow. occasional whiteout conditions. snow is drifting. 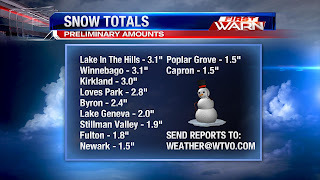 (2:26:58 PM) nwsbot: Local Storm Report by NWS LOT: Poplar Grove [Boone Co, IL] trained spotter reports HEAVY SNOW of M1.5 INCH at 02:20 PM CST -- storm total as of 200pm. ground blizzard in open areas. east west oriented roads...particularly rt 173 are drifting over and practically impassable. also very icy road surface leading to numerous accidents. visibility at time of report 1/4 to 1/2 mile. (2:25:43 PM) nwsbot: Local Storm Report by NWS LOT: Spring Grove [Mchenry Co, IL] public reports SNOW of E4.0 INCH at 02:22 PM CST -- snowing since 1 pm. (1:55:27 PM) nwsbot: Local Storm Report by NWS LOT: WNW Bull Valley [Mchenry Co, IL] cocorahs reports HEAVY SNOW of M1.9 INCH at 01:30 PM CST -- storm total so far. snow began at 1220 pm. heavy snow at time of report. 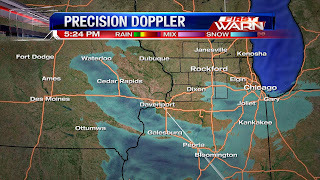 2:23pm Update: Our precision doppler is still showing the heaviest snow south & east of Rockford. Visibilities under a mile in these spots. Expect near whiteout conditions to continue through this evening, especially in open areas and rural roads. 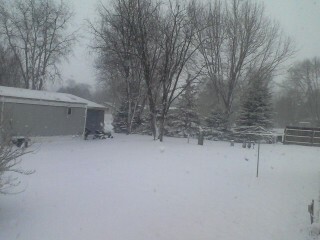 Here's a viewer picture from Jamie Vertz and Mike Sharp in Rochelle showing the snow just after 2pm. 1:30 pm Update: Moderate to heavy snow will contine from southeast Wisconsin through north-central Illinois to the Quad Cities. Snowfall rates of half an inch to an inch per hour will be possible with the more heavier snow. 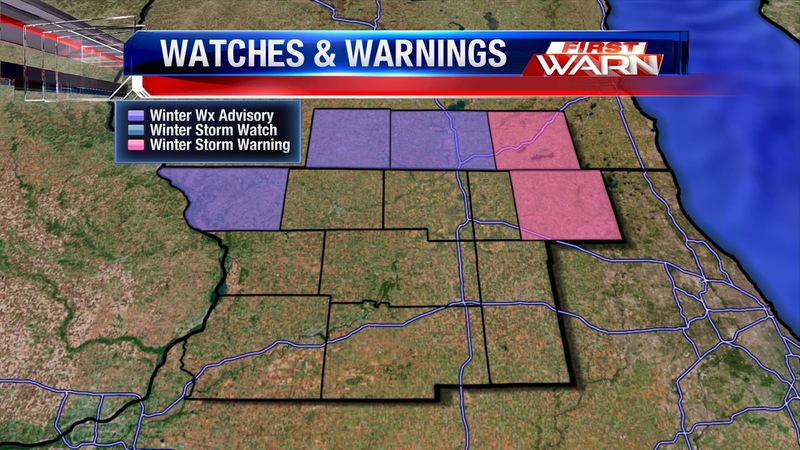 Whiteout conditions have been reported south of Rockford near Oregon, DeKalb, Sycamore, Dixon and Rochelle. Travel will become dangerous this afternoon and evening. (11:57:32 AM) nwsbot: Local Storm Report by NWS LOT: DE Kalb [De Kalb Co, IL] trained spotter reports HEAVY SNOW of M0.5 INCH at 11:56 AM CST -- niu. last 30 min. 12:40 pm Update: Heavy snow is falling near Chicago and surrounding suburbs early this afternoon. 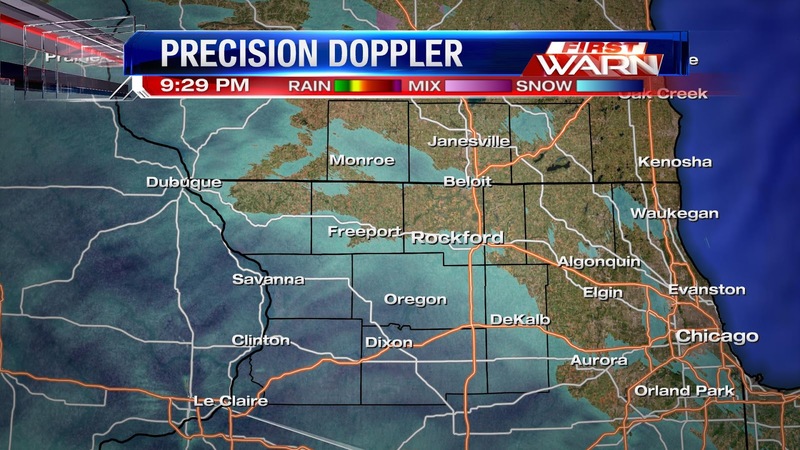 Moderate to heavy snow has also been falling south of Rockford. Visibility within the heavier snow has dropped to less an a mile, and in some cases less than a half mile further east. 11:30 am Update: Winter Storm Warning just issued for Carroll and Whiteside counties beginning now and lasting through Noon Wednesday. A Winter Weather Advisory continues (tan shading) for the remaining N. IL and S. WI counties. 10:45am Update: The leading edge of the rain, snow and sleet is beginning to overtake the dry air in place from earlier this morning. Already sleet has been reported in Naperville and downtown Chicago and this will continue to lift north and west. The area highlighted on the satellite and radar image is what's known as the 'deformation band'. It's usually where the strongest precipitation, whether it be rain or snow, occurs and is found just north and northwest of low pressure. Watching this throughout the morning it's slowly been lifting north and will continue to move into Northern Illinois and Southeast Wisconsin through the afternoon. Going forecast for snow totals around 3" still looks on track with snow to liquid ratios remaining right at or slightly below 10:1 (meaning heavy, wet snow). Road conditions will rapidly deteriorate once the snow begins. Winds continue to gust around 35 mph which will cause blowing snow through the afternoon and early evening. A dry east wind is in place across Northern Illinois and Southern Wisconsin this morning. A mixture of sleet, snow, rain and even freezing rain has been falling downstate while a switch to heavy, wet snow has been falling in southeast Iowa, Northern Missouri and West-Central Illinois. The dry east wind will keep the leading edge of the precip to the south through the morning but by early afternoon the atmosphere quickly saturates allowing a wintry mix to move in from south to north roughly along I-88. As the low moves into East-Central Illinois later this afternoon temperatures will be in the low 30s but cooling temperatures a couple thousand feet above will allow a transition to a heavy, wet snow from mid-afternoon to this evening. Accumulations will range from just a couple inches north to close to 4" south. It's possible there may be a few isolated locations that reach close to 6", but I think most will receive closer to 3". Despite snow totals the strong east/northeast wind will cause road conditions to deteriorate once the snow does fall late this afternoon and visibility will drop as well. 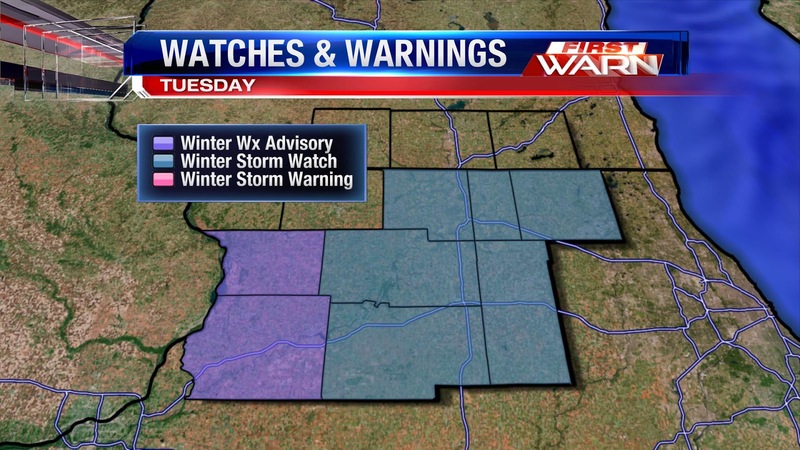 A Winter Weather Advisory will go into effect at Noon today for all of Northern Illinois and Southern Wisconsin. Just like last week's storm system, there is a lot of uncertainty with what we'll seeing heading into Tuesday, but here's one thing we can promise... the Tuesday night's commute will be a messy one. Here's a look at Tuesday's Impact Forecast. Things should stay quiet during the morning hours with the chance for wintry precip starting after noon. The earlier it moves in, the better chance we'll have of seeing a rain/snow mix, but things are expected to switch over to heavy, wet snow by the late afternoon. Combine that with wind gusts up to 40mph, and roadways are going to be messy through the evening hours. 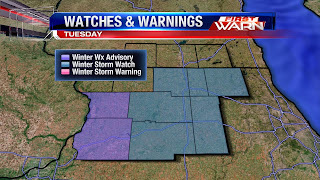 Because of all this, the NWS has northern Illinois under Winter Weather Advisories and Winter Storm Watches for Tuesday. NWS Chicago will more than likely update the Winter Storm Watch Tuesday morning, once they have a better idea of what we will see. For everyone wondering about snow totals, this will be very similar to what we saw last Friday. We're looking at 2-4" of accumulation, with heavier totals to the south. Whatever snow we see will be at the mercy of the winds, which is the biggest concern on Tuesday. 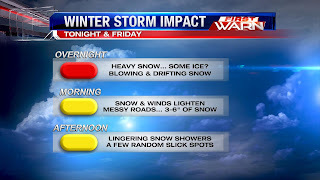 Keep it tuned to WTVO Channel 17, FOX 39, and the First Warn Weather blog for the latest on this next storm system! While it seems this next storm hasn't received as much of attention as the one last week, it has and will pack a punch for the Plains and Mississippi River Valley. 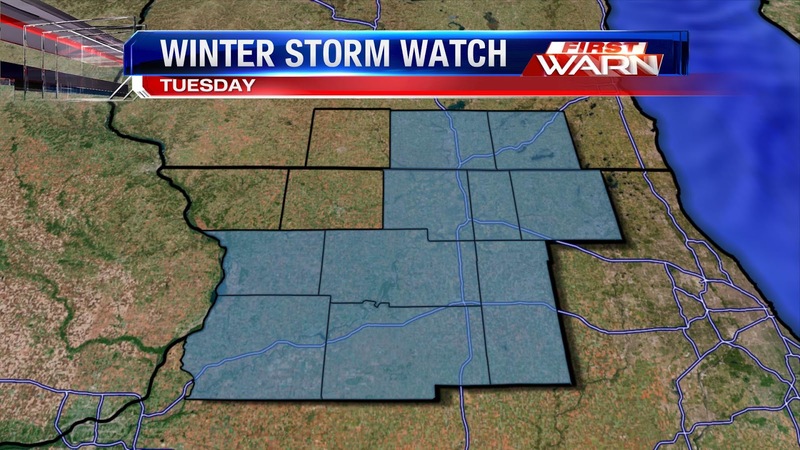 Winter Storm Watches (blue shading) continue for a portion of Northern Illinois but have been canceled for Rock and Walworth counties. The reasoning - a slight shift south with the storm track was observed earlier this morning. If you watched the forecast Monday morning, or even Sunday night for that matter, you already knew this was a very difficult storm to try and forecast and that a 'forecast bust' was possible regarding snowfall. While the overall track of the storm has been fairly consistent amongst weather model data, subtle differences with the temperature profile, analysis of current snow cover and upper air features have caused me to gain a few more gray hairs this morning - and that continues here this afternoon! Looking over some of the latest data that has come in this morning it looks like snowfall totals reaching anything higher than 3" may be hard to come by. Temperatures at the surface Tuesday will remain very close to freezing and it's possible that we may even rise into the low to mid 30s now that we've been able to melt away some of the current snow. As the snow melt continues the models have had a very hard time picking up on this feature because it's occurring on a very fine scale. This means by the time the snow were to begin Tuesday models are forecasting surface temperatures slightly cooler than what they may actually end up being. Also, with slightly warmer temperatures there is a chance that a wintry mix may occur at the onset during Tuesday afternoon before enough cooler air aloft wraps into the storm to allow a transition over to snow. Low pressure will track out of Texas this afternoon and into Southern Illinois by Tuesday afternoon. As of right now it appears as if the band of heaviest snow may occur just to the south and east of the Rockford area with Southeast Wisconsin, Northeast Illinois and maybe even around the Quad Cities receiving some of the higher snow totals. The snow will fall Tuesday afternoon and it's possible a little lake enhancement with the northeast fetch off of Lake Michigan will cause higher snow totals from Milwauke to Kenosha to Waukegan to south of Chicago, but I think the further west you head from the lake the snow totals will decrease - significantly. Right now I feel a forecast between 2"-4" is more likely with amounts closer to 4" in the highlighted areas stated above. Regardless of snow amounts the winds will be strong Tuesday which will cause any snow that's falling, even if it's an inch or two, to blow around and reduce visibility. Right now this snowfall doesn't look to be any bigger than the previous snowfalls we've experienced this winter season. If anything does change between now and this evening we'll be sure to provide updates right here! We've been getting a lot of questions about Tuesday's snow. As usual, the biggest question is, "How much snow are we going to get?" Since a small change in this storm's path means a big change in how much snow we actually get, we're still not sure... but just like last week's storm, it looks like we're getting snow and it's going to be messy come Tuesday. 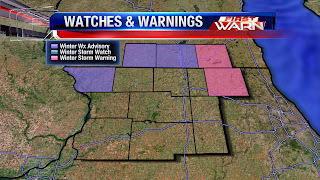 Let's start off with Tuesday's watches and warnings. 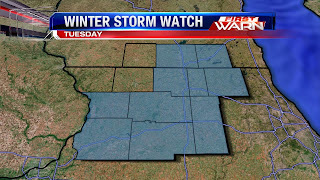 Most of the Stateline is under a Winter Storm Watch on Tuesday because of accumulating snow and strong winds that will cause blowing, drifting, and reduced visibilities. 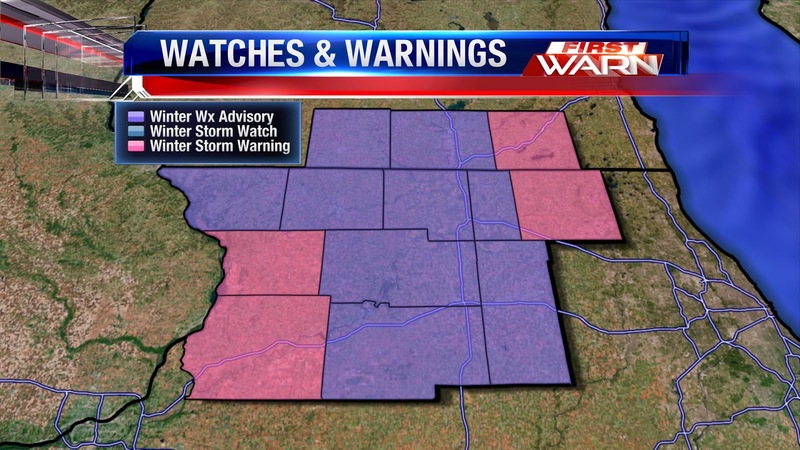 All three of the NWS agencies that cover the Stateline are putting up big numbers with this storm. Our in-house models aren't buying it just yet... and frankly, I'm waiting until Monday to believe it myself. While I think we'll get accumulating snow... I'm thinking 6" might be the high end of what we see with higher snow totals as you head south and west (Some model runs early Sunday were suggesting a bulls-eye around the Quad Cities). Just like last week's storm system, here's what we know for sure. 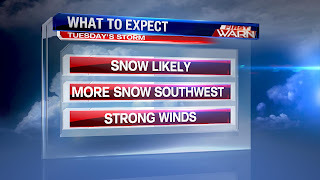 There will be accumulating snow on Tuesday and strong winds will make it messy, especially for the evening commute home. Snow will still be possible Wednesday, but it will not be as messy as Tuesday. Snowfall during the month of February has been anything but lacking. We've received over 15" of snow this month boosting us nearly 9" above our month average. Unfortunately, when looking back to December 1st (which is the beginning of Meteorological Winter) we're still almost 8" below. While we've made up for lost time these past few weeks it looks like the last week of February will not go out quiet. The next winter storm has already moved into the Pacific Northwest and will dive out of the southern Rockies and into the panhandles of Oklahoma and Texas by Sunday night. By Monday the low will be moving near the Missouri/Arkansas border and then to St. Louis, MO by Monday night. Tuesday the low will be tracking across central Illinois before moving into Michigan by Wednesday. Unlike this past storm that just came through, this one looks to take a more southern track. One reason, the recent snowfall we received will act somewhat like a baroclinic zone ( mini frontal boundary ). Storm systems tend to follow where there is the greatest temperature gradient. An area that has snow cover on the ground often times is cooler than a surrounding area that doesn't have as much or very little snow cover. As of Saturday afternoon the ground was white down through central Illinois and almost all of Missouri. Now by Sunday some of the snow will have likely melted due to the sunshine expected, but there should still be a little snow left on the ground. Some accumulating snow will be likely across the area Tuesday but the temperature profile may be a bigger factor with this storm than with the last. Warmer air wrapping into the storm from the east and southeast could cause a mixture of sleet, rain or even freezing rain from a line east of Kenosha, WI to Woodstock to Rochelle to Dixon while areas west of that line have a greater probability of all snow. Accumulating snow will occur for parts of Northern Illinois and Southern Wisconsin but just like the last storm, this one will also be in a weakening phase when it arrives. Once this main low passes it'll continue to spin in the eastern Great Lakes for the next few days keeping snow in the forecast through next Thursday. While Thursday night's "winter storm" fizzled out as it moved into the Stateline, we'll have another shot at some decent snow totals starting Monday night. Model runs have a low pressure passing to our south Monday night and Tuesday, putting us at risk for being in the bulls-eye of heaviest snowfall. Don't panic just yet, though. Many model runs have this storm passing far enough south that central Illinois gets the heaviest snow, not the Stateline. More info this weekend! Snowfall totals as of 7:00pm range from 2-5", which the heaviest snowfalls in McHenry County and Jo Daviess counties. A few light snow showers will still be possible this evening, but no further accumulation is expected. If you have any snowfall totals to report, please send them in! E-mail us weather@wtvo.com. Thanks! 7:50 am Update: Heavy snow from the overnight has ended, however, low pressure is now moving near Muscatine, IA and a band of light to moderate snow has developed just to the north. This snow band is now crossing the Mississippi River with visibility dropping to less than 2 miles from Galena to Savanna. Snow will move back into the Stateline between 9am/10am (a little sooner west of Rockford) and continue into the early afternoon. An additional inch or two will be possible with the second round of snow. As was mentioned earlier, a dry wedge of air has wrapped itself around low pressure currently in northern Missouri. This has essentially ended the heavy snow from south to north and will continue to do so through the remainder of the morning. There are, however, snow showers in Iowa that will rotate through later today. Current winds are sustained from the east around 10-20 mph with occassional gusts nearing 25 mph. Blowing and drifting snow will occur through mid-morning until the winds ease a bit and shift to the southeast and then southwest. So far snow totals range from the 2"-3" mark across the Stateline. (2/22/2013 11:05:48 AM) nwsbot: Local Storm Report by NWS DVN: 7 NNW Mount Carroll [Carroll Co, IL] trained spotter reports SNOW of M3.0 INCH at 07:00 AM CST -- snowfall total. (11:05:45 AM) nwsbot: Local Storm Report by NWS DVN: 7 NNW Mount Carroll [Carroll Co, IL] trained spotter reports SNOW of M3.0 INCH at 07:00 AM CST -- snowfall total. (7:44:25 AM) nwsbot: Local Storm Report by NWS DVN: Freeport [Stephenson Co, IL] trained spotter reports SNOW of E4.0 INCH at 07:37 AM CST -- storm total so far. (7:44:25 AM) nwsbot: Local Storm Report by NWS DVN: ESE Monmouth [Warren Co, IL] trained spotter reports SNOW of M4.5 INCH at 07:37 AM CST -- still snowing. (7:21:49 AM) nwsbot: Local Storm Report by NWS LOT: Byron [Ogle Co, IL] public reports SNOW of E3.0 INCH at 07:17 AM CST -- relayed by wtvo. 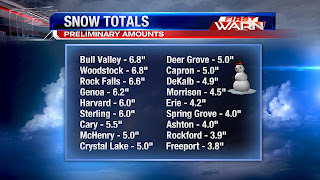 (6:59:46 AM) nwsbot: Local Storm Report by NWS LOT: Rockford [Winnebago Co, IL] trained spotter reports SNOW of M3.0 INCH at 06:50 AM CST -- storm total. east side of town. (6:26:44 AM) nwsbot: Local Storm Report by NWS LOT: N Huntley [Mchenry Co, IL] cocorahs reports SNOW of M3.8 INCH at 06:15 AM CST -- overnight snowfall. 4 inches on ground. 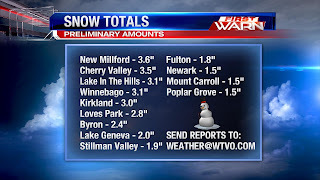 (5:21:57 AM) nwsbot: Local Storm Report by NWS LOT: 4 WNW Rockford [Winnebago Co, IL] broadcast media reports SNOW of M2.5 INCH at 04:00 AM CST -- wtvo tv rockford. (4:44:36 AM) nwsbot: Local Storm Report by NWS MKX: Edgerton [Rock Co, WI] trained spotter reports SNOW of M2.2 INCH at 04:43 AM CST -- snow covered roads. (2:40:11 AM) nwsbot: Local Storm Report by NWS LOT: Rockford [Winnebago Co, IL] broadcast media reports SNOW of M2.5 INCH at 01:08 AM CST -- northeast side of rockford. still moderate snow falling. blowing and drifting snow. (2/22/2013 12:57:14 AM) nwsbot: Local Storm Report by NWS MKX: Beloit [Rock Co, WI] trained spotter reports SNOW of M0.5 INCH at 12:55 AM CST -- in the past hour. still snowing with blowing snow. snow-covered roads. 2/22/2013 12:20:02 AM) nwsbot: Local Storm Report by NWS DVN: 4 WNW Dubuque [Dubuque Co, IA] trained spotter reports SNOW of M2.9 INCH at 12:19 AM CST -- still snowing. The snow is starting to move in, but a small change to the forecast could really affect our snow totals heading into Friday morning. The overall timing of the forecast and the hazards with this storm haven't changed. We're still talking heavy bursts of snow late this evening through the early morning hours combined with wind gusts of 30mph to create lowered visibilities and blowing and drifting snow. Roads will be messy Friday morning, although winds and snow will calm significantly heading into the afternoon. Here's the change... dry air is starting to get wrapped up into the storm system. This means accumulating snow may end earlier than expected, especially to our south. In fact, our latest in-house models are picking up on that drier air and dropping snow totals along the I-88 corridor. Our next winter storm is almost here! Here's the latest. Precision Doppler is showing the bulk of our snow still sitting in central Illinois as of 5:25pm. Snow is expected to move in after dark and start picking up major steam around 9:00 or 10:00pm. Here's the latest impact forecast. The heaviest snow will fall late this evening and through the overnight. Snowfall rates could top 1" an hour. Combine that with wind gusts of 30mph, and we're talking blowing and drifting snow... not to mention limited visibilities. The snow and wind will calm by Friday morning, but the morning commute is looking messy, especially on secondary streets and untreated roadways. The snow forecast hasn't changed much from Wednesday. We're still talking 3-6" for most of the Stateline, with an extra inch or two possible for our western counties (Jo Daviess, Carroll, and Whiteside). Just a reminder to take it easy on the roads tonight and tomorrow morning. If you have an emergency kit in your car, make sure it's ready to go. If you don't, you should get an emergency kit! Basics include a first aid kit, a flashlight, blankets, water, and food. We'll keep you updated through the night as the snow starts to fall... and don't forget to send us your snow reports or pictures. They help us know what's going on out there! E-mail them to weather@wtvo.com. Thanks! Heavy snow with snowfall rates of 2" per hour continues to fall in Northeast Kansas and Northern Missouri! Even thundersnow has been reported near Topeka, KS with thunder, sleet, snow and freezing rain in Joplin, MO. This storm is headed in our direction later today but will be weakening as it does. Overall snowfall forecast still looks on track with 3"-6" of snow occurring, however, areas west of Rockford closer to the Mississippi River could see higher amounts. A few flurries are possible throughout the day as clouds thicken and are able to squeeze out any moisture within them. I anticipate snow to move near the Quad Cities between 3pm-6pm and spread northeast between 6pm-9pm with all of Northern Illinois and Southern Wisconsin seeing snow by 9pm. The snow will start light but quickly turn heavy with snowfall rates of 1" per hour for a brief period. Snowfall may be heavy for a 2-4 hour period before turning light once again by Friday morning. Help for the Snow Drought?